This solidified relationship provides the opportunity, “to work in coordination with the institutions concerned to protect and conserve our environment,” continued Sr. Avilés. 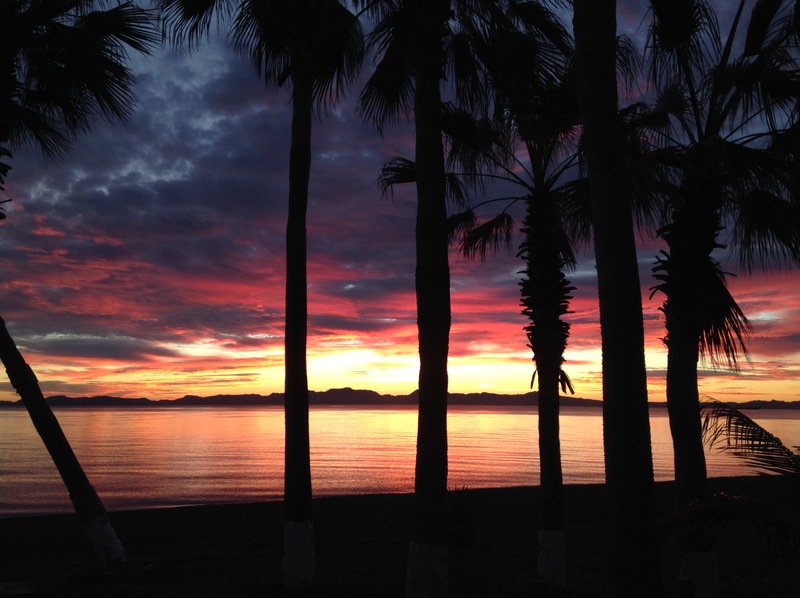 The Sister City connection furthers a move toward confirmation of Sister Park/Sister Reserve between the Channel Islands National Park and The Bay of Loreto National Park. Eco-Alianza de Loreto, A.C. spearheaded the possibilities of the Park inter-relationship, as well as Sister City status, and has served both as facilitator and coordinator of the programs in a close working relationship with the Channel Islands National Park and the City of Ventura. When completed, the Sister Park/Reserve relationship will provide for the exchange of best-science practices, park resource management and enhanced Sister City economies associated with eco-tourism programs including unique cultural exchanges. President Avilés was accompanied by his wife Mrs. Nancy Saldaña Cuevas, Tony and Linda Kinninger co-founders with Hugo Quintero Maldonado of Eco-Alianza, Marla Daily and Kirk Connally, of Santa Cruz Island Foundation and Terra Marine Research & Education, Inc., and Norma Garcia, the representative of the Loreto Sister Cities committee and a member of the Board of Directors of Eco-Alianza. The day after the ceremonies, Mayor Heitmann and the contingency from Loreto enjoyed a boat tour to Santa Cruz Island, hosted by Island Packers, where they routed the University of California Research Field Station facilities with an inland Jeep tour. Following lunch, the group boarded a small plane for an aerial tour of the Channel Islands and a flight back to the Camarillo airport. That following evening, the Sister Cities committees met at City Hall to begin planning first steps. Mayor Heitmann lead the meeting with introductions, short presentations and a Q & A for all those attending. Eco-Alianza would like to thank all those involved for making this first step both a success and a reality. Special thanks goes to Russell Galipeau, Superintendent of the Channel islands National Park, Kate Faulkner, Chief, Natural Resources Management, CINP, Yvonne Menard, Chief of Interpretation, CINP, and most especially to Mayor Cheryl Heitmann for organizing this first meeting of the Sister Cities and for making the Loreto delegation feel so welcome in their beautiful city. We look forward with great anticipation to the benefits of the Sister City relationship that is key to both the proposed Channel Islands National Park and Parque Nacional de Loreto Sister Park status. These photos were taken on Mex 1 near Catavina in the middle of the Baja ..
i hear the chatter of early beach walkers, their figures shrouded in the dark, their voices announcing their presence before i can make out their shadowy forms .. girl talk, boy talk, start the day talk. a cruise ship waits to unload their guests for an exploration of our small town of Loreto. morning. wednesday. for those of us with breath, we begin again. I am a storm watcher/lover .. but this one, Odile, may be hard to love. While I’ve been stateside for the duration, my heart and energies have been focused on Baja – the long skinny peninsula that is my second home. Power is out. Phones are down. The early photographs of Cabo show horrible damages – and to a city that has a very substantial infrastructure and in new construction, modern building codes. The rest of the Baja – maybe not so. It’s horrible not knowing what happened to my neighbors and the town. One video shot from the top of the Mission Hotel shows waves breaking on to of the malecon. I can only imagine that the streetfront businesses had minor to major flooding. A brief cell phone call late yesterday afternoon from my next door neighbor – how it got through I have no idea – said that her house was totally flooded from the horizontal rain – that she’d gone through all the towels – wrung them out – and the water was still coming in. Her fans had been ripped off – and then she had to go. No power to recharge her one lifeline to the outside world. Loreto was hard hit – that’s obvious from the storm track and early reports before power was cut. But Loreto, too, has a decent infrastructure – and some of the most resilient people I have ever known. All of Baja for that matter. Shovels, mops, bulldozers will be hard at work before the rain drizzles have stopped. 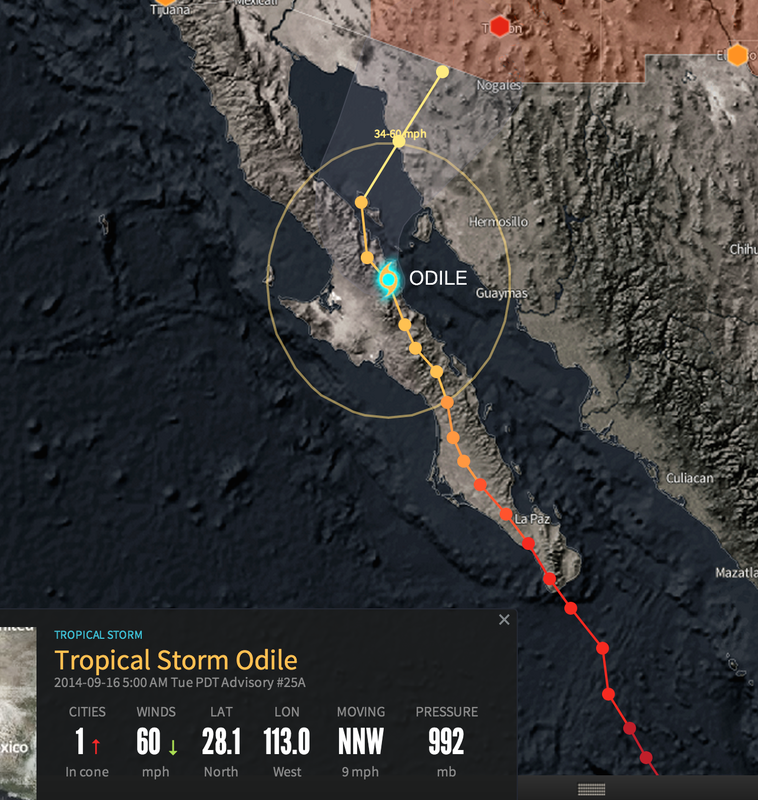 The most pressing issue will be the roads and flash flooding that Odile has likely caused. Mex One is the lifeblood of the peninsula and trucking of supplies has the one route north and south. Unlike the states, when the roads was out, everyone that is able jumps into help. Tractors tow semi-trucks through washing and mud-laden arroyos. Boulders get moved off the road. New paths are created around obstacles. There is no shutting down the highway for months while surveyors decide what to do and budgets have to be settled and contracts awarded. Nope. Just get on with getting on and move people and goods. Detailed repairs will happen later. This morning, all prayers to those who lost homes, autos – whatever Odile threw at them. And hopes that hands together, a speedy recovery can be made. And then .. there is the next storm. Really? Polo? Please please head west ……. 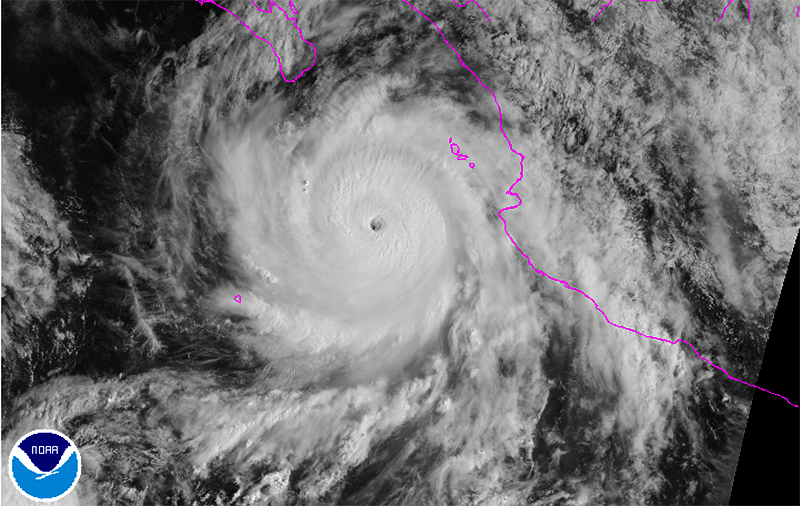 “Odile” is the latest in a string of late-season hurricanes with similar paths – off the west coast of Baja. But each one seems to have been moving slightly closer to land – and Odile looks as he he’ll skim the coastline, wreaking havoc with winds and rain. On Sunday morning, the storm has already intensified to a Category 4 – a “major and dangerous hurricane” – with sustained winds at 135mph and gusts up to 160mph. Batten the hatches. Put up the storm shutters and bring all the patio furniture inside. Even in their fury, the storms seen from satellite are mesmerizing. Small waves and lots of laughter. I stood up on my first wave and was awash with jubilation! What fun! What just plain darn good fun. Stand up, ride the wave, fall down and laugh. Totally in the moment. No past. No future. Present to the water and the surf. Joy!